In November of 2017, a group of Year 7-9 students performed at the Shakespeare school’s festival at Hull’s university in the Gulbenkian theatre. We performed an abridged version of Shakespeare’s Twelfth Night. We auditioned as soon as we came back in September and we got to rehearse for a couple of months before, which meant that we put hours of hard work into creating this play. At one point in the run up to the show, we went for a day’s workshop at Hull University, which was run by professional actors. During the course of that day, we learnt lots of things about Shakespeare and how we can present ourselves more confidently when performing. For example, we learnt to emphasise the important words with specific hand gestures to help communicate the story to the audience, breaking through the language barrier. 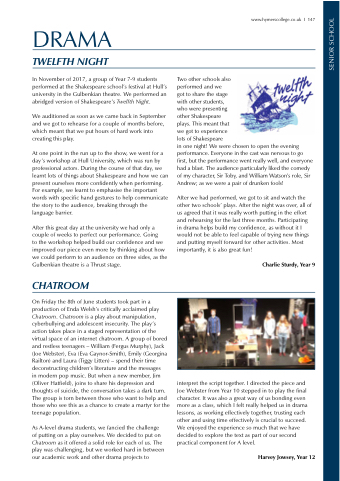 to the workshop helped build our confidence and we improved our piece even more by thinking about how we could perform to an audience on three sides, as the Gulbenkian theatre is a Thrust stage. in modern pop music. But when a new member, Jim (Oliver Hatfield), joins to share his depression and thoughts of suicide, the conversation takes a dark turn. The group is torn between those who want to help and those who see this as a chance to create a martyr for the teenage population. in one night! We were chosen to open the evening performance. Everyone in the cast was nervous to go first, but the performance went really well, and everyone had a blast. The audience particularly liked the comedy of my character, Sir Toby, and William Watson’s role, Sir Andrew; as we were a pair of drunken fools! After we had performed, we got to sit and watch the other two schools’ plays. After the night was over, all of us agreed that it was really worth putting in the effort and rehearsing for the last three months. Participating in drama helps build my confidence, as without it I would not be able to feel capable of trying new things and putting myself forward for other activities. Most importantly, it is also great fun! interpret the script together. I directed the piece and Joe Webster from Year 10 stepped in to play the final character. It was also a great way of us bonding even more as a class, which I felt really helped us in drama lessons, as working effectively together, trusting each other and using time effectively is crucial to succeed. We enjoyed the experience so much that we have decided to explore the text as part of our second practical component for A level.